You are here:Home » Euromil News » Soon Trade Unionism in the Italian Military? Soon Trade Unionism in the Italian Military? In Italy, military personnel are still denied joining military professional associations or trade unions. Despite several court cases and bills in the Italian Parliament, there seemed to be no positive evolution/development in this regard. 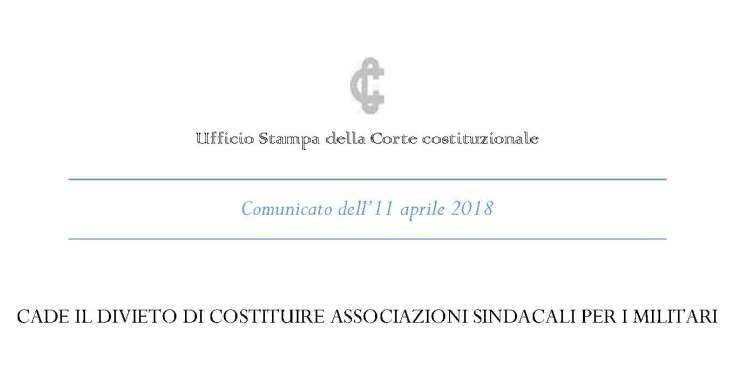 However, in a public meeting on 10 April 2018, the Italian Constitutional Court had to judge on the question of the denial of trade union rights to military personnel and consider whether the current ban is in line with the European Convention on Human Rights and the European Social Charter. On several occasions, as well the Court as the lawyers of the different parties, referred to the Adefdromil and Matelly cases before the European Court of Human Rights (ECtHR) and the EUROMIL v. Ireland case at the European Committee on Social Rights (ECSR). Already on 11 April 2018, the Constitutional Court released a statement on this case on its homepage. In its statement, the Court refers to article 11 of the European Convention on Human Rights as well as article 5 of the European Social Charter and the possible “restrictions on the exercise of these rights by members of the armed forces” foreseen in both articles. According to this statement it seems that a new crucial step has been taken in Italy. However, the judgement and argumentation used by the Italian Constitutional Court will have to be thoroughly analysed once published. EUROMIL will support its Italian member association Association Solidarity Rights and Progress (AS.SO.DI.PRO. ), which is at the basis of this case, as well as its longstanding supporter the talian General Confederation of Labour (CGIL) in preparing the change of legislation with Italian policy- and lawmakers to implement the decision of the Court in the best. As we learned from the French case at the ECtHR, the final execution of a judgment does unfortunately not always produce the expected results! Please click here to read the press release of the CGIL, AS.SO.DI.PRO. and associated partners on the decision of the Court in Italian.